Welcome to the Harpers Ferry National Historical Park Information Page. Here you will find all you need to know about the natural and human history of the park. Learn about the geology, trees, mammals, birds, or other plants and wildlife of the area, as well as the historically important events and influential people of the area. Non-rush hour driving time to Harpers Ferry from Reagan National Airport and BWI Airport is about 1 hour 30 minutes. Driving time from Dulles International Airport is about 50 minutes. From Interstate 495 West take the left exit (EXIT 45) and merge onto VA-267 West, the Dulles Toll Road (stay in local lanes, not express airport traffic lanes) / Dulles Greenway toward Leesburg (Portions toll). Follow to Exit 1, VA-7 W on the left toward Lessburg/Warrenton. Take the VA-9 exit toward Hillsboro / Charles Town, WV merging to the right onto Charles Town Pike / VA-9. After approximately 10 miles on VA-9 you will come to a light where you will bear right onto VA-671 N / Harpers Ferry Road. Follow this road until it ends at the lighted intersection of US 340 / Jefferson Pike. Turn left onto 340. Follow US-340 N to the four way intersection in Harpers Ferry (approximately 2.5 miles), staying in the left lane. Turn left at the light (you will see a large sign for the Park) and continue through to the entrance station. After crossing second bridge (Shenandoah River) proceed to stoplight at top of hill. Turn left into the main entrance of the park. The park is home to approximately 14 amphibian, 18 reptile, 36 mammal, 30 spider, 43 fish, 174 bird, and 276 insect species. Among these are the southern flying squirrel (Glaucomys volans), the northern copperhead (Agkistrodon contortrix), and the bald eagle (Haliaeetus leucocephalus). Plants are a very important component of the park since approximately 70% of its land is forested. Distinct upland, lowland, and floodplain vegetation communities are present throughout the park. Numerous fern species including woolly lip fern (Cheilanthes lanosa) and marginal shield fern (Dryopteris marginalis) occur in the park. Grasses, sedges, and rushes also play a valuable role in the plant communities. Tall brome grass (Bromus pubescens) and greenish sedge (Carex virescens) are just a few of the local species. Trees such as chestnut oak (Quercus prinus) and tulip poplar (Liriodendron tulipifera) often dominate the forest canopy; whereas, red maple (Acer rubrum) and hackberry (Celtis occidentalis) are frequently scattered through the understory. Common shrub species in the park include spicebush (Lindera benzoin) and mountain laurel (Kalmia latifolia), while popular wildflowers include Virginia bluebells (Mertensia virginica) and wild columbine (Aquilegia canadensis). Approximately 360 million years ago, when the continent of Africa collided with North America, land comprising the park began to take its current shape. At this time the Appalachian Mountains rose and the Potomac River began cutting through them, forming the water gap we see today between Maryland and LoudounHeights. From numerous places throughout the park, visitors are able to enjoy this and many other scenic vistas Harpers Ferry has to offer. From the rolling Blue Ridge Mountains that steeply rise above the historic district to the rushing waters of the Potomac and ShenandoahRivers bordering the town, one is in awe of the surrounding beauty. Seventy percent of the park is covered with eastern deciduous forest with the predominant soil type here being a shaly silt loam. Quartzite, phyllite, and limestone are the predominant rock types, each playing a role in the formation of such popular sights as the Stone Steps and the water gap. Floodplain communities line the banks of the Potomac and ShenandoahRivers. Visitors have the opportunity to experience these plus many more beautiful and exciting natural features. Some of the important historical figures to learn about at the park are Robert Harper, Thomas Jefferson, George Washington, Meriwether Lewis, John H. Hall, James H. Burton, John Brown, Thomas J. “Stonewall” Jackson, Frederick Douglass, W. E. B. Du Bois, and Don Redman. Through theatrical reenactments and museum exhibits, experience Harpers Ferry stories about John Brown’s Raid, The Civil War, African American history, industry, transportation, and natural heritage. Harpers Ferry National Historical Park is open daily from 8 a.m. to 5 p.m. and closed Thanksgiving Day, Christmas Day, and New Year’s Day. All groups planning to visit Harpers Ferry National Historical Park must make reservations a minimum of two weeks before the scheduled arrival date. Educational groups are required to make reservations a minimum of three weeks in advance. Unless the group has been granted an official fee waiver, all fees apply. For group reservations call the Entrance Station at (304) 535-6299 OR fax your request to (304) 535-2905. Group fees are assessed at the time of reservation. National Park Service employees will determine group status as commercial or non-commercial. Pets must be kept on a six-foot leash at all times while visiting any area of the park. This prevents encounters between pets and wildlife, protects pets from hazards, and prevents unwanted interaction between pets and other visitors. Retractable leashes should be kept at a maximum length of six feet. All pet waste must be removed from the park. If you are visiting with your pet, please remember to bring plastic bags or a scoop and determine how you will transport waste from the park. Pet waste may not be left on the ground or disposed of in park trash receptacles. 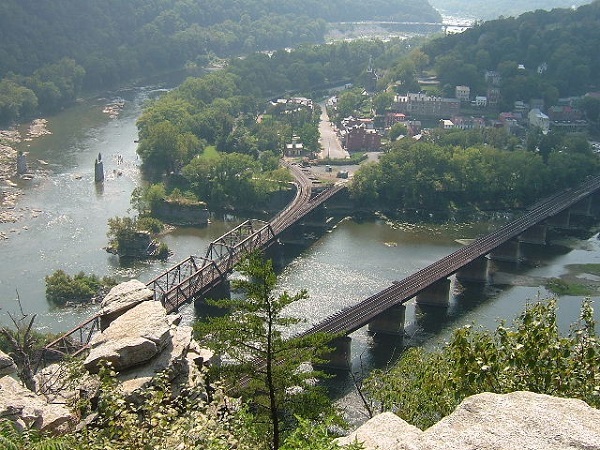 Harpers Ferry Park offers a wide variety of activities for individuals and families. Visit the many museums and exhibits, hike scenic trails, join a ranger-guided tour or just explore on your own. The Harpers Ferry Historical Association’s Bookshop has a great supply of books, artwork, postcards and items for kids of all ages.